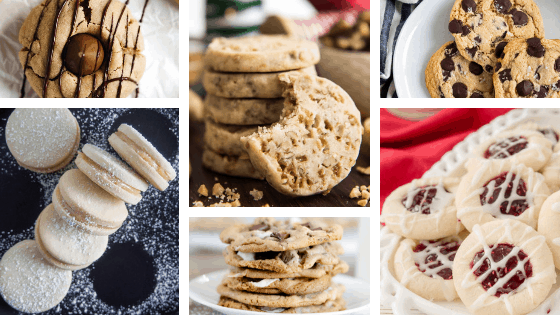 With over 50 Top Cookie Recipes in this post, you’re sure to find some new recipes to add to your collection! Below you’ll find anywhere from Blossom Cookies to Cookies for Christmas. In this list, you will find Vegan and Gluten-Free options as well! Everyone enjoys a delicious cookie and there are so many different types out there to choose from. During Christmas time, sugar cookies and ginger cookies are popular while Chocolate Chip cookies are a favorite cookie all year around. Whether you’re celebrating a birthday or Christmas, there’s a cookie below for you! Gluten Free Almond Flour Cookies with Cranberries from What’s in the Pan? Maple Pecan Cookies (Vegan & Gluten-Free) from Yup, it’s Vegan!